A little while ago, I tried Iskiate, the Mayan and Tarahumara superfood drink, for the first time. 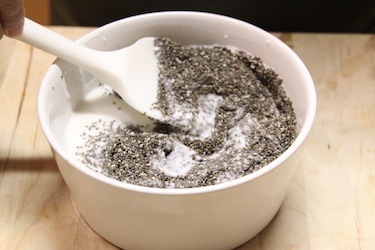 The superfood in the drink is chia seeds and they’re rich in nutrients. When mixed with water and left to sit, the seeds form a jelly-like substance around them and act as thickeners. 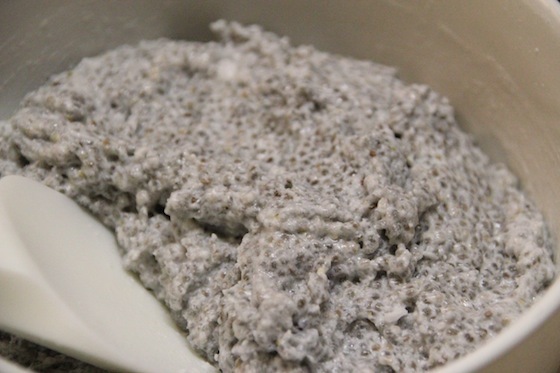 This quality presents a neat use for chia seeds – to use them in a pudding application and not have to use traditional thickeners or have to cook the pudding. The result is similar to tapioca pudding! I found this super simple recipe online, and decided to base my pudding on it. 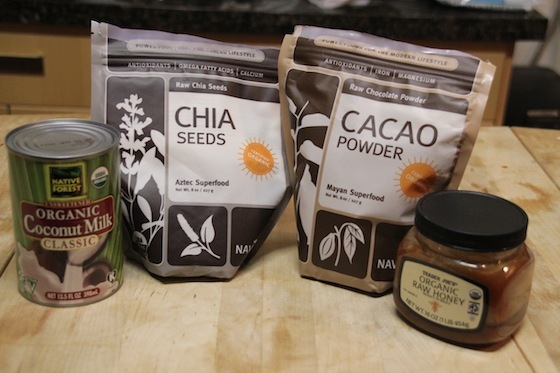 Basically, all you need for this version of chia pudding is coconut milk, chia seeds, and a sweetener. 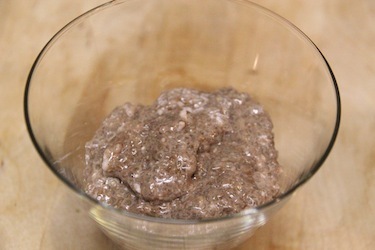 I thought I might try to make mine with another “superfood”, cacao powder. 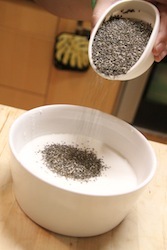 Then you’re supposed to let the seeds sit in the coconut milk for 30 minutes, with a stir every 5-10 minutes. 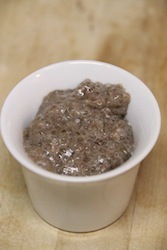 After the first 10 minutes had passed, I realized I had either mis-measured the chia seeds, or the recipe was off. 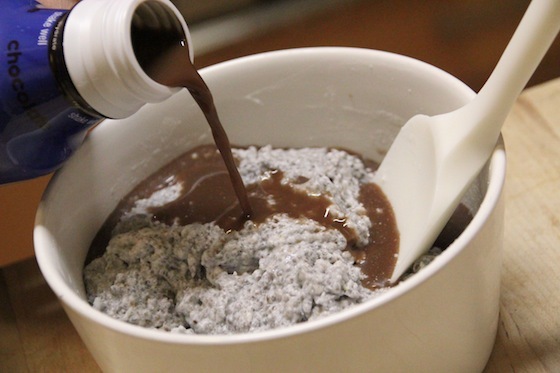 The mixture was like paste already! Another 20 minutes of setting, and I’d have to cut the pudding into chia jigglers. I decided to skip the cocoa powder and honey, and add some more liquid that had both cocoa and sweetener in it. Zico Chocolate Coconut Water is the BOMB. I added that and tried to incorporate it into the quickly congealing pudding. The chocolate flavor and sweetness from the Zico wasn’t really enough to flavor the whole batch of pudding, so I ended up adding some leftover chocolate Torani syrup I had lying around – which made the mix not really Paleo, but it was an easy way to add some sweetness and chocolate flavor. Also, if you notice in the picture on the left, there are little white bits in the pudding – those are actually coconut oil globules, a side effect from either me adding the coconut water after the chia seeds had started to congeal, or because I put the mix in the fridge between stirs. 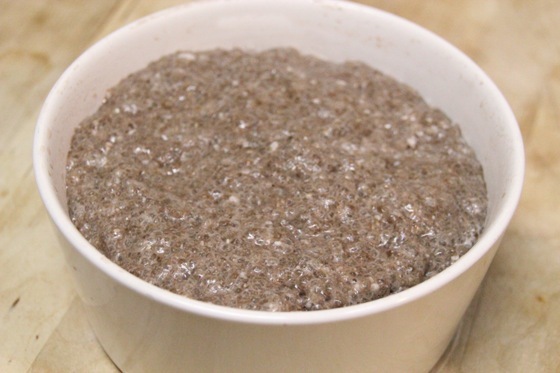 I don’t think that was the best thing to do, since coconut oil does solidify in colder temps, so I think it wasn’t incorporated properly into the mix with the chia seeds. It was still delicious, the main ingredients are totally healthy and good for you, and I’ll definitely be making this again. Navitas Naturals – Certified Organic Kosher Raw Vegan Healthy Cacao Chocolate Powder – 16 Oz.